"Macros" are what we on the street fondly call Macronutrients. In short, these include the primary dietary sources of energy (calories) and are what make up the majority living beings' bodies (aside from water); Protein, Carbs, and Fats. But before we talk about Macronutrients, we should discuss the concept of Macromolecules. The prefix "macro" means large, and macromolecules are large molecules made up of either several smaller molecules or individual atoms and can range from a couple dozen to billions of atoms. For reference, each molecule of table salt has 2 atoms and each molecule of water has 3 atoms. Some of you may have already noticed the over lap, protein is protein and carbohydrates are carbohydrates, meanwhile dietary fat is a type of lipid (lipid is the category, more on this later), and nucleic acids aren't considered a dietary macronutrient although you may be most familiar with the primary type of nucleic acid called DNA. Each type of macromolecule is made up of smaller, repeating sub-units. when you are talking about one single sub-unit, it is called a monomer ("mono"=one, "mer"=part). When you are talking about the entire macromolecule, you are talking about a long string of the sub-units put together, it is called a polymer ("poly"=many, "mer"=parts). NOW, lets break down each type of Macromolecule and talk about how each one contributes to your diet as a Macronutrient. Then, we will briefly discuss how to read Nutrition Labels and how to pick the foods that suit your goals. Proteins are comprised of repeating sub-units called Amino Acids. When one amino acid binds to another amino acid, it is referred to as a peptide, in this case a dipeptide ("di"=two). When many amino acids are bound together, it is called a Polypeptide. For very large chains of amino acids, we commonly call the entire macromolecule a Protein. Polymer form: "Peptide" aka "Polypeptide" aka "Protein"
There a many kinds of amino acids, but humans only make and use proteins consisting of different combinations of 20 specific amino acids. There are additional amino acids that humans need and use, but they are not involved in protein production. 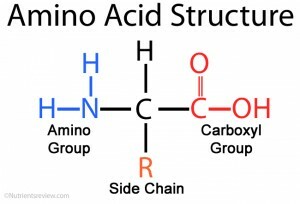 An amino acids are called amino acids because of their structure. Each molecule has a carbon atom as its base. Surrounding it are 4 different groups. A Unique Side Chain group that is different for each and every amino acid and is what makes amino acids different for each other. there are 20 different unique groups, each corresponding to 1 of the 20 different amino acids. Why Should We Consume Protein/Amino Acids? Proteins are the building blocks of the body. You hear this all the time and it is definitely true (although in reality all macronutrients can be considered building blocks). There are two main categories of proteins in the body, structural and enzymatic. Structural proteins are those that are the building blocks. They help reinforce structures such as your cells and help them keep their shape, like the metal beams that hold up a sky scraper. Other times they constitute enzymes, which are smaller proteins that are designed to help specific chemical reactions take place inside your body. Good examples of these are digesting the food you eat, or changing that food into energy at the cellular level; of course there are many, many more. Sometimes things aren't so black and white, and the protein can be both structural AND enzymatic. Great example: Muscle Proteins. Muscles are made of tons of protein (Shocker, right?!) and these proteins run in long chains linked from one end of a muscle to the other. they attach to the muscle along the way and at the ends (that is the structural part). But the cool thing that happens is they also act as enzymes, which take the energy from ATP molecules and release it, causing the links of the protein chain to move closer to each other and "bunch up." (think of flexing your bicep). So because it uses the ATP molecular reaction muscle protein is enzymatic; and because it is bound to the muscle cell walls and pulls the muscle shorter and thicker in the middle, it is structural. ALL protein is made of Amino Acids, so we need to ingest amino acids to make new protein. The interesting thing is we can actually make a number of amino acids in our bodies without eating them, these are called nonessential amino acids. Others we absolutely have to ingest to get them, these are called essential amino acids. Most of our amino acid source comes from eating proteins, and then breaking the protein down into the amino acids during digestion and absorbing them. However, we can also buy and consume amino acid supplements for those that we may be deficient in. Not all people require amino supplements, so consult your trainer or physician for advice! The 9 amino acids on the right are essential (vital), which means they are necessary for the human life and health but cannot be produced in your body so you need to get them from foods . These amino acids can be synthesized in your body, but in certain circumstances, like young age, illness or hard exercise, you need to get them in additional amounts from foods to meet the body requirements for them. Ornithine is also considered conditionally essential amino acid, but it does not form proteins . These amino acids can be synthesized in your body from other amino acids, glucose and fatty acids, so you do not need to get them from foods . In the human body, glucogenic amino acids can be converted to glucose in the process called gluconeogenesis; they include all amino acids except lysine and leucine. See Protein Metabolism for more information. Ketogenic amino acids, which can be converted to ketones: isoleucine, leucine, lysine, phenylalanine, threonine, thryptophan and tyrosine . Ketones can be used by the brain as a source of energy during fasting or in a low-carbohydrate diet. Meats, eggs, milk, beans, high protein vegetables i.e. broccoli, spinach, yogurt, protein shakes, tofu, nuts and seeds. Carbohydrates (carbs) are comprised of repeating sub-units called monosaccharides. When one saccharide binds to another saccharide, it is referred to as a disaccharide ("di"=two). When many saccharides are bound together, it is called a Polysaccharide. For very large chains of saccharides, we commonly call the entire macromolecule a Complex Carbohydrate. Another root word you see a lot with sugars is "-ose" so if you see a word ending in it, it is likely a form of sugar/carbohydrate. Monomer form: "Monsaccharide" or "Disaccharide" sometimes called "simple carbs" or "simple sugars"
Polymer form: "Polysaccharide" aka "Complex Carbohydrate"
There are many kinds of carbohydrates, and these come in a variety of forms, ranging from simple, to complex, to indigestible. The name carbohydrate comes from the simple make-up of the molecule's chemical structure. They have a back bone made of Carbon atoms. The "hydrate" comes from the fact that there are Oxygen and Hydrogen atoms surrounding the carbon backbone, the same atoms that make up water. Some types of sugar come in chain form and others come in a ring shape. There are sugars with a 5 carbon backbone (ribose) instead of the typical 6, with roles in areas other than nutrition - i.e. making up your DNA! Why Should We Consume Carbohydrates? Carbohydrates are one of our primary energy sources, although all macronutrients do contain energy. Consuming carbohydrates to fulfill energy requirements is necessary partly because consuming enough protein to meet your energy requirements can lead to excess levels of nitrogen in the blood, which then must be removed by your kidneys. However, since most people don't eat solely meat and other high protein sources, one of the more practical purposes for consuming Carbohydrates to meet your energy requirements lies in other reasons. Since the primary source of carbohydrates in nature are plant based foods, eating whole food sources of carbohydrates is sure to help you consume your daily requirements of micronutrients. These will be discussed in other future articles, however some examples include magnesium, potassium, and many vitamins. Fruits and Vegetables are varied in the types and parts of the plants they come from, and consequently have differing quantities of simple, complex, and fibrous carbohydrates. Simple sugars, such as fructose found in fruits such as bananas, should be kept to a minimum. Artificial sources such as candy or sugar cereals found in processed foods should always be avoided. They have the potential to cause insulin resistance and diabetes in high quantities. And over long term, can cause inflammation of the arteries which can cause arteriosclerosis and cardiovascular disease. When you do eat simple sugars, I recommend to consume them at a time when your body is primed to quickly absorb and utilize them so they don't hang around in your bloodstream - i.e. right after a great workout! Complex carbs, such as starch found in potatoes, sweet potatoes, and the like, eventually get broken down into simple sugars in the digestion process before being absorbed. So once in the blood stream, they look just like simple sugar. One main difference comes from the fact they must be broken down before absorption, and that means they trickle in a little slower than when you consume simple sugars. This leads to less blood sugar spiking, and consequently less insulin spiking. However, over consuming complex carbs can still lead to high blood sugar. Starch is the primary way plants store energy, so when we consume starchy foods, we gain a good amount of energy towards our calorie count. When our own bodies have an excess of energy, we store it in two forms: Fat or Glycogen. Glycogen is similar to starch, but it is the energy storage carbohydrate molecule form that animals utilize. Both molecules are essentially complex interconnected chains of sugars all connected together. In humans, we can find glycogen in both the Liver and Muscles. We will discuss this more in other articles, however it should be noted that Glycogen in the liver can be broken down into simple sugars and put into the bloodstream for the whole body to use, whereas glycogen stored in muscles can only be broken down and used within that specific muscle. Fibrous carbs, aka dietary fiber, is found in all plant material, but especially in leafy greens. A lot of dietary is cellulose, the chief component of the cell wall of plant cells. Eating fiber doesn't give us additional calories, because we cannot digest the fiber. but it is useful in keeping our stool moving smoothly and preventing constipation. In addition, because it comes from plants, these foods are high in micronutrients and very filling. A nice large salad is always a great go to when you want to fill your belly but don't have a lot of calories left for the day! Checkout carbohydrate metabolism for more on this topic. Simple Carbs: Fruits i.e. Bananas, Strawberries, Grapes, Pears, Oranges, Blueberries; Sweet Onions. Some fruits, such as Zucchini, aren't particularly high in any type of carbohydrate, but are technically fruits not vegetables. Other fruits such as avocado are higher in fats than in carbohydrate. Fiber: Leafy Greens: Spinach, Brussels Sprouts, Green Beans, Asparagus, Broccoli, Kale, Lettuces, Colliflower. Lipids come in different forms, such as triacylglycerides, phospholipids, sphingolipids, and cholesterols such as steroid hormones. Nutritionally speaking, Triacylglycerides are the most important. They are composed of two subtypes of molecules, glycerol and acyl chains. Glycerol is a small alcohol molecule used as a backbone to allow polymerization of Acyl chains. Acyl chains are strings of carbohydrates. When not bound to a glycerol, the acyl chains are called Fatty Acids. There are many differeing kinds of Fatty Acids, distiguished by their length and number of double bonds. More on this later. There are many functional uses for lipids, ranging from nutritional energy, building blocks for cell membranes, to hormone signalling (cholesterol derived steroid hormones). An fatty acids can vary greatly in length and number of carbon atoms. At the end is a carboxylic acid, allowing it to bind to a glycerol. Along the length can be a variable number of double bonds (this is where get trans/saturated/unsaturated/Omega-3 Fatty acids. Acyl chain - chain of carbon atoms without -OH hydroxyl groups. Glycerol molecules always have 3 carbons and 3 -OH groups. but the OH groups may look different when bound to FA’s. Why Should We Consume Lipids? Lipids in humans have a couple of primary functions. 1) Energy: Fats store larger amounts of energy than either of the other macronutrients per gram. This allows our bodies to store more energy in less amount of space. Lipids are able to do this in part because they repel water, in contrast with carbohydrates which attract water. This means that as they are built, they don’t have the extra weight or space of the water. 2) Protection: body fat provides insulation from cold as well as a physical barrier and cushion for important body structures. Fat build up inside your arteries is not a good thing, but small amounts of fat surround your blood vessels on the outside, around your stomach, intestines and a bunch of other organs to cushion them from banging against each other during movement. 3) Structural: Lipids are the primary structure making up the membrane of every cell in the body. Phospholipids and sphingolipids are modified TAGs. Cholesterol is also a part of the membrane that helps create important structures called lipid rafts, which allow important proteins to work with the cell membrane. 4) Signalling: Hormones come in a variety of different forms, many of which are called steroids, which is a class of molecules created from modifying cholesterol. 5) Storage: Some vitamins are attracted to water, and others are attracted to fat. We are able to store important vitamins in our fat long term, which is important for vitamins that are present in foods in lower quantities. Saturated Fatty Acid - These FAs have no double bonds at all. This means that all of the possible double bond locations are already saturated, or occupied by, hydrogen atoms. They very in length, but all have a common pattern of zig-zaging in a streamlined fashion. Unsaturated Fatty Acid - These FAs come in many forms, but all have at least 1 double bond. The location and number of double bonds changes the properties of the FA. Cis-FA - “cis” means same, both hydrogens are on the same side of the double bond. This causes a KINK in the chain, bending it to one side because the Hydrogens t ake up space on one side and the extra room on the other causes it to bend. Trans-FA - “trans” means across, the hydrogens are on opposite side of the double bond. This makes an unsaturated double bond APPEAR like a saturated FA. This is one reason why Trans Fats can be dangerous. Saturated Fats are solid at Room Temperature. This has to do with the stream-lined nature of their molecule. because they are stream-lined, they can get up much closer to each other and create solids. Unsaturated Fats tend to be liquids at room temperature because their bent molecules create more space and prevent them from aggregating. Omega-3 FA - the third from the last bond is a double bond. Omega refers to the last position. Omega-6 FA - the sixth from the last bond is a double bond. Omega refers to the last position. Essential FAs include Linoleic acid and Alpha-Linoleic Acid. Humans can produce the FAs it needs from other materials, except for 2: linoleic acid (LA), an omega-6 fatty acid, and alpha-linolenic acid (ALA), an omega-3 fatty acid. Because we cannot make them, we MUST consume them in the diet. They are important building blocks for other materials and structures, such as cell membranes. Other FAs are conditionally essential because they are produced very slowly, so it is preferred to get them through the diet. These include the omega-3 fatty acids eicosapentaenoic acid (EPA) and docosahexaenoic acid (DHA). DHA is especially important in brain tissue cell membranes. Cholesterol is not a major source of calories in the diet. Our bodies make most of the cholesterol we need on it’s own in the liver, and how much we eat is of little consequence to the average person. However, some individuals can be affected more by dietary cholesterol than others due to genetics. Cholesterol is used to make our hormones, and is a natural part of human physiology. However, when arteries become damaged, cholesterol can get lodged into the tears and cause plaques to form. ALA and LA are found in plant and seed oils. Although the levels of LA are usually much higher than those of ALA, rapeseed oil and walnut oil are very good sources of the latter. EPA and DHA are found in oily fish (e.g., salmon, mackerel, herring). AA can be obtained from animal sources, such as meat and egg yolk. Saturated Fats and Cholesterol are derived largely from animal sources. Nucleic acids aren’t considered one of the 3 macronutrients, however they comprise the 4th macromolecule. They are the main storage molecule of our Genetic code, and it is from this code that our body makes different proteins and other molecules. Monomer form: "Nucleotide” or “Nucleoside” or some times just called a “base” when used in context. A Phosphate Group - used for linking each nucleotide together. Why Should We Consume Nucleic Acids? You should always eat them! (for the most part). They are in all whole foods, plant or animal! They are in relatively small amounts though in the diet and are of little consequence for most people. We will discuss DNA in other physiology lessons.